The $8 bln carrier posted dismal quarterly earnings, weighed down by fuel costs. But opportunity may be knocking, as indebted rival Jet Airways comes into play. A deal by Singapore’s influential Indian partner Tata would bring newfound clout in a promising growth market. 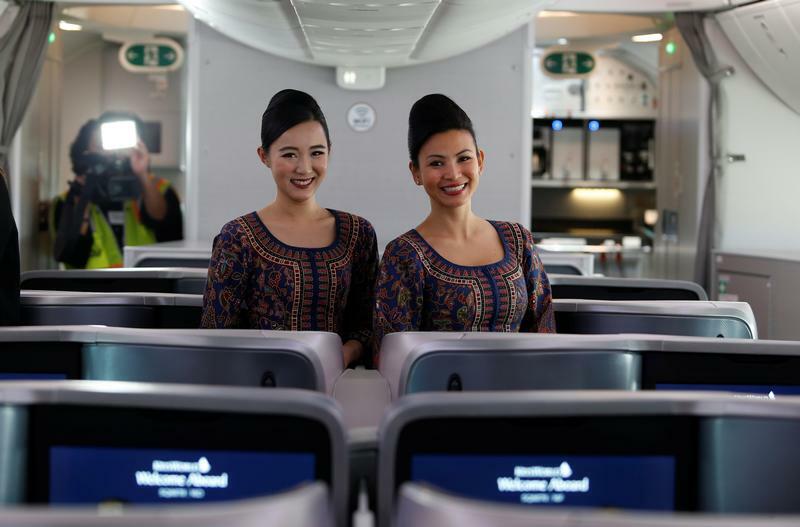 Singapore Airlines stewardesses Karie Choo (L) and Joslyn Hue pose for photos in the business class section of the 787-10 Dreamliner after a delivery ceremony at the Boeing South Carolina plant in North Charleston, South Carolina, U.S., March 26, 2018. Picture taken March 26, 2018. Singapore Airlines said on Nov. 13 that second-quarter earnings for the three months to the end of September fell 81 percent to S$56 million ($40.6 million), from a restated S$293 million a year earlier. Excluding a loss relating to its minority stake in Virgin Australia, the company’s adjusted net profit was S$172 million, down 41 percent. Net fuel costs for the group in the quarter rose 24 percent, while costs excluding fuel rose just over 4 percent. Quarterly group revenue grew 5.6 percent to S$4.1 billion, but passenger yields, a proxy for ticket prices, fell 2.2 percent, indicating the company has lagged rivals like Cathay Pacific in raising fares. Regional airline SilkAir and low-cost carrier Scoot both posted operating losses in the second quarter. Singapore Airline shares are down 12 percent so far this year. In morning trading on Nov. 14, the first trading day after the earnings, the stock was down 1.4 percent at S$9.29.